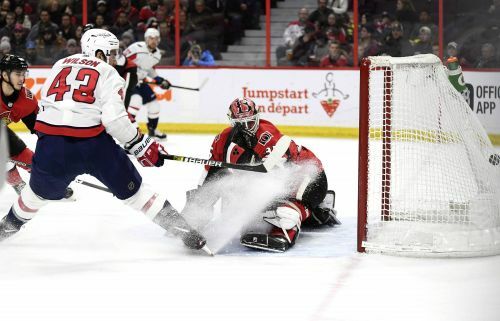 OTTAWA, Ontario (AP) — It was a night of firsts for the Washington Capitals on Saturday. Tom Wilson scored, Tyler Lewington and Madison Bowey each got their first career goals and the Capitals beat the short-handed Ottawa Senators 3-2. Lewington and Bowey are the first Capitals defensemen to get their first goals in the same game. Lewington also had a Gordie Howe hat trick with an assist and a fight against Zack Smith in his second NHL game. "The first game I was definitely nervous, and this game I was still a little nervous but the guys have been great making me feel comfortable," Lewington said. "I wasn't really thinking of (the Gordie Howe hat trick). It just kind of happened, but it's kind of cool. I've only had one other one back in junior. I don't know if I'll ever get another one." The Capitals have won four straight, and the Senators have dropped four in a row. Pheonix Copley made 31 saves for Washington. The Senators were without top defenseman Thomas Chabot and fellow blue-liner Christian Jaros following injuries Friday in a 6-3 loss to the New York Islanders. Jaros broke a finger, and Chabot was placed on injured reserve with an upper body injury following a hit from Islanders forward Matt Murray in the second period. Both players are expected to miss 3 to 4 weeks. The Senators had goaltender Marcus Hogberg making his first NHL appearance. Hogberg made 21 saves, and Colin White and Mark Stone scored for the Senators, who are last in the Eastern Conference. "It was as tough ... for him coming in but he gave us a chance, and we had a chance to the very end so he did his job," Senators coach Guy Boucher said of Hogberg. Stone scored at 16:30 of the third period, creating a white-knuckle finish. "The boys played really well in front of me and helped me see some pucks and it's nice to have it done," said Hogberg, who has split time between the AHL and ECHL the past two seasons. Lewington assisted on the game's opening goal by Wilson at 7:12 of the first period for the first point of his career and whistled a shot past Hogberg at 16:00 for his first NHL goal. Late in the second period, he got his first fighting major in a bout with Smith. Bowey gave the Capitals a 3-0 lead just 61 seconds into the second period when he skated in from the point and beat Hogberg with a shot from the top of the faceoff circle. "I'm happy it went in, obviously. It's been a long time and it definitely felt great. It turned out to be a big goal for us and I'm happy we got the two points," Bowey said. "To see (Lewington) score and get the Gordie Howe hat trick is really special." The Senators got one back when White was credited with a goal at 4:22 of the second after a Washington challenge for goaltender interference was dismissed. Senators rookie Brady Tkachuk earned an assist on that goal but just 33 seconds later was knocked to the ice by a hit to the head from Bowey. Tkachuk immediately jumped to his feet and received an instigator minor, fighting major and misconduct for going after Bowey. He drew a loud cheer from the home crowd when he left the penalty box three minutes into the third. NOTES: The Capitals have won the past four meetings between the two teams. ... Saturday was the second of three meetings between teams this season. The Capitals were 4-0 winners in Ottawa on Dec. 22 and they meet again in Washington on Feb. 26. ... The Senators recalled Ds Stefan Elliott and Christian Wolanin from Belleville of the AHL on Saturday. Capitals: Host Nashville on Monday. Senators: Play at Columbus on Monday night.